What did it take to pull this off? First, this event could not have been made possible without the generous support of our lead sponsor The Miami Foundation, as well as from Lyft, Ride2MD, the Miami Center for Architecture & Design, Tri-Rail, Whole Foods and the Health Foundation of South Florida. Public transit is a complex challenge given the number of stakeholders that play a role - and we sought to engage agencies and individuals within each key areas to build momentum for this movement. 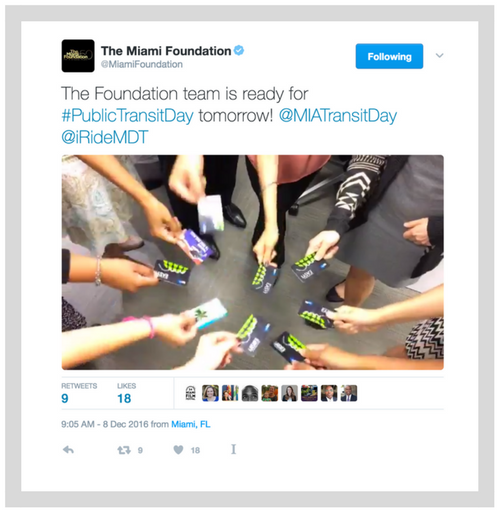 As the leader in the Miami public transportation space, we began by partnering with the Miami-Dade County Department of Transportation & Public Works; their support and engagement during this day of action greatly amplified the success of the day. We also engaged the Metropolitan Planning Organization (MPO), the Greater Miami Chamber of Commerce, and both county and city elected leaders. Municipalities such as City of Doral stepped up their particpation by creating a video promoting Public Transit Day and organized local businesses to provide discounts to trolley riders. Our initial efforts focused exclusively on engaging Miami’s stakeholders, but as we began to build momentum for the event, stakeholders from all across South Florida lined up to join in. Given that transit is truly a regional issue (as many travelers commute between cities for work and other opportunities) we coordinated with Tri-Rail, Palm Beach MPO and Broward County to engage locals and elected leaders, publicize the event and partner with us as we advocate for advancements in South Florida’s vast and complex network of public transit options. Throughout the lead-up to the event, we received support from both our outreach partners and host committee which consisted of individuals and community organizations all dedicated to improvements in our public transportation system. Our outreach partners, who went above and beyond to help us showcase this event, included: Buskerfest, The Underline, EVOS, The Greater Miami Chamber of Commerce, The AO Insight and Rosado and Associates. In addition, the teams at The New Tropic, Prism Creative Group, Sustainable MIA and The Conroy Martinez Group helped us plan and get the word out leading up to and during the day. The host committee, who actively promoted the event, included: Albert Lee (Local Measure), Alice Bravo (Miami-Dade Department of Transportation and Public Works), Alissa Farina (Miami Science Barge), Amy Rodriguez, Anna Prisse (WeWork), Carlye Wisliceny (Whole Foods), Caryn Lavernia (Florida International University), Cheryl Jacobs (AIA Miami and the Miami Center for Architecture & Design), C.L. Conroy (Conroy Martinez Group), Daniel Horton (Candidate for State Representative), David Doebler (VolunteerCleanup.org), George Fernandez (Ride2MD), Ileen Delgado (Miami-Dade Department of Transportation and Public Works), Isabella Akcer (PRiSM Creative Group), Jodie Knofsky (Consultant), Justin Wales (Engage Miami), Maggie Fernandez (Sustainable Miami), Meg Daly (Friends of the Underline), Melissa Hege (Melissa Hege Planning & Transportation), Mitchell Bierman (Greater Miami Chamber of Commerce Transportation and Infrastructure Committee, Chairman), Natalia Arias (Dream in Green), Nick Uhren (Palm Beach MPO), Peter Wood (Health Foundation of South Florida), Ralph Rosado (Rosado and Associates), Rob Kiskupic-Knight (Engage Miami), Roland Rafuls (EVOS), Ryan Vega, Sam Cohen (Lyft), Shekeria Brown (SFCDC), Stuart Kennedy (The Miami Foundation), Valerie Neilson (Palm Beach MPO), Vance Alouopis (Children’s Movement) and Vince Sciullo (Tri-Rail). Thanks to this all-star group of supporters, over 500 individuals (including almost 40 elected leaders!) pledged to ride transit on Public Transit Day. Community members, businesses, and local organizations throughout South Florida hosted events and activations to celebrate Public Transit Day. A special thanks for the following businesses for hosting Public Transit Day-themed events and/or specials: Taurus Beer & Whiskey House, Sweat Records, ACME Lounge, Mina’s Meditarraneo, The Wynwood Yard, Coyo Taco, Zuuk Mediterranean Kitchen, My Ceviche, Perricone’s Marketplace & Cafe, Toasted Bagelry and Deli, Blue Tree Juice, Power Pizza, La Sandwicherie Brickell, and Sushi Maki.